I want your software package! Should I choose your CD or no CD (direct download) option? When I purchase your software package, am I entitled to new Amateur Radio programs that are added to the package after my purchase? I have purchased a couple of programs from you. How can I upgrade to a software package? Are upgrades free to registered users? I purchased N3FJP's Software Package and CD some time ago. Since then you have released new versions for a number of programs. Can I get a new CD with full use of your software for less than $64.99? I just changed my call sign! Do I have to change my call sign / password combination in AC Log or the contesting software? When using your log for Field Day, do we have to purchase separate licenses for each computer we use? Our club registered your software. Are club members allowed to use the club registration at home or elsewhere for their personal use? I know your upgrades are free, but I also realize how much time and effort coding these enhancements and new programs takes and that your pricing policy doesn't fully reflect that. Can I send you something to show my appreciation for your continued efforts? How do I download and install a program from the website? How do I install the program on a computer that is not connected to the Internet using a data storage device? Can I transfer the log data file from my "old program" to AC Log? How do I get my log that I have kept as an MS Excel worksheet into AC Log? What are the operating system requirements for the newer versions of your software? Which emulator are Mac users running with the new versions of your software? Is there a way to download your entire software package at once? Why is my Internet protection software blocking the program installation? How do I submit my contest log entry after the contest is finished? Help, the contest robot won't accept my Cabrillo log file? How do I transfer my contest contacts to AC Log and specify the correct mode that LoTW and QRZ will accept? I want to keep a copy of my contest file. How do I save it? I'm using Vista / Windows 7 or 8, and I can't find the ADIF/Cabrillo/Other file that I formatted for contest submission? Can I use AC Log to create a Cabrillo file for contest submission? If someone sends cut numbers in CW, should I log the letter or the number it represents? How do I enable upload to online score sites such as CQContest.net and ContestOnlineScore.com? Can I use Amateur Contact Log for ARRL's International Grid Chase 2018 event? Can I use one contest program to log multiple, overlapping contests on the same weekend simultaneously? Can I run AC Log and operate multiple contests simultaneously, with rig interface and CW sending enabled? I'd like to operate X contest. The exchange is X. Which program should I use? How do I log a station on a county line? What are the steps for upgrading to the latest version of Amateur Contact Log? I just bought a new PC! How do I transfer Amateur Contact Log and my contacts to my new computer? How do I maintain data on two computers that aren't networked together? Can I maintain multiple log files on AC Log? I'm part of a multi ham family, but we only have one logging PC in the shack. Is there a way we can all use AC Log? How do I sort my log file by date? How do I export my log to a data storage device? I would like to backup or transfer my AC Log customized settings. Which files should I copy? I purchased a customized graphic of my call sign to display each time the software starts. Where do I save the file so that it automatically displays properly? I no longer have a 3X (or earlier) version of AC Log installed, but I still have my log data file. How can I transfer my log to the newer version of AC Log? When I sign on to Windows with a different user profile, why is a new log started? If I ever have to restore from backup, what is the best approach? What's the best way to protect myself from data loss? How do I set up DX Spotting and filter the DX spots I see? Can I connect to the VE7CC software running on my PC from your programs to receive DX spots? The DX Spotting telnet host I usually use is down. How do I select a different host? How do I set AC Log to identify DX spotted entities as New if I've worked them before, but they are new on that band or mode? How do I include comments with my DX Spot? Do your programs support the ARRL's Logbook of the World? In addition to regular contest submission, can I upload my contest data to the ARRL's Log Book of the World? I uploaded records to LoTW but they aren't marked as sent? I can successfully upload to LoTW, but no data is returned when I do a download? I am having trouble setting up LoTW? Why am I seeing a message about duplicates when I upload contacts to LoTW? Can I disable the password prompt I see each time I upload to LoTW? I have signed into QRZ with my password, but the QRZ Online Callbook feature does not seem to work. I use the Buckmaster HamCall CD. Is there a way I can copy the data to the hard drive and have AC Log access it for faster lookup? I use the QRZ CD. Is there a way I can copy the data to the hard drive and have AC Log access it for faster lookup? The QRZ Callbook Lookup function stopped working and is only returning the person's name? I want to have a "hard copy" of my contest log. How do I print it? I want to format and print a report for * * award submission. How can I do this? Is there a way to print directly to QSL cards without using labels? How do I choose and customize AC Log's data entry fields? Why are some of my QSO records appearing blank until I click on them? The AC Log bearing and distance doesn’t seem to work properly for stateside QSOs? I've rearranged the column header order and changed some of the widths in AC Log. How do I save these changes? How do I get AC Log to display the date format I want? The sort function is returning an order out of chronological sequence. AC Log always inserts CW or SSB in the Mode Field even when I try to change it. How do I set the UTC clock offset with the new versions of your software? How do I configure AC Log for fast paced, non-contest operations such as DX-peditions, special events, operating from a lighthouse or IOTA location, etc.? How do I setup the playing of audio wave files? How do I set the contest program to let me know if the juicy contest DX I am about to work is in my AC Log master log file? How do I set the software to connect to multiple rigs simultaneously for SO2R operation? What do the default confirmation codes and colors mean? Do you have a video for new folks, demonstrating the very basics of how to use the Field Day software? How do I set up the program for networking, accessing a common data file with multiple PCs? We are going to have multiple stations, but we aren't going to set up a network. How can we combine the log files after the contest? You have lots of information on setting up your software for networking, but can you help us set up the network itself? How do we handle GOTA station contacts? How do I submit our Field Day entry to ARRL? How do I fix the Unable to Execute SQL Command error? If our Field Day network server fails, how do we recover from backup? Why do I get a com port sharing error message? Why doesn't the com port I want to use show up in the program's com port list? Would you mind if I put a link on my website to your site, http://www.n3fjp.com/? Will your logging software interface with any digital software and other programs? Do you have a quick start guide to interfacing digital and other software with your programs? You've added direct upload features for LoTW, Club Log and eQSL. Do you have any plans to also add direct uploads to QRZ? How do I control my antenna rotor, tune a SteppIR or Ultrabeam antenna, or switch the antennas while using your software? Why am I unable to upload my ADIF file to ___ with my name in the Operator field? What is the easiest way to perform bulk or global edits to all my records at once? Am I limited to entering the modes listed in the AC Log mode drop down list? How do I configure AC Log for proper ADIF output for WWFF Parks on the Air? Do you have a list of keyboard shortcuts? Do you have Application Program Interface (API) functionality coded in your software? An external service (LoTW, QRZ, etc.) or hardware device suddenly stopped working? Is there an e-mail users group for your software? Can you change group(s) e-mail distribution list to my new e-mail address for me? In addition to this FAQ page, do you have more detailed help? I know your upgrades are free, but I also realize how much time and effort coding these enhancements and new programs take and that your pricing policy doesn't fully reflect that. Can I send you something to show my appreciation for your continued efforts? You've been at this a long time! What are your future plans for N3FJP Software? The package without CD is absolutely the best way to go. I am constantly updating my software, adding new enhancements and modifying the programs to accommodate contest sponsor's rule changes. All these upgrades are always available for download and free to registered users, so it's best to install the latest a few weeks before each contest. The programs you receive on a CD are of course fixed at that point in time, so in a few years they may not reflect current rules or the best my software has to offer. In addition to providing the latest and greatest software, the package without CD is cheaper, too, so it is by far your best choice! When I purchase one of the software packages, am I entitled to any new Amateur Radio programs that are added to the package after my purchase? Yes, any new Amateur Radio programs will be freely available to those that have registered our software package. We will send an e-mail announcement with information about the new program to our announcements e-mail group. If you have registered the package and would like to use the new software, just send us an e-mail and we'll forward an updated password list. We offer hams who have purchased combinations of software to be able to use the amount they have contributed so far towards the $64.99 N3FJP Software Package and CD or the $49.99 N3FJP Software Package without CD. Please e-mail us and we will confirm your registrations so far and give you the amount you need to upgrade to the package of your choice. Then, if you wish to use your credit card or PayPal, just go here and use the Upgrades button near the bottom. Yes, so far all upgrades have been free to registered users. We have no plans to change the policy at this time. I purchased the N3FJP Software Package and CD some time ago. Since then you have released new versions for a number of programs. Can I get a new CD with full use of your software for less than $64.99? Yes, upgrades are free to registered users. You have already purchased the package so all you need is a new CD. You can purchase a new CD for only $15 (including shipping). Please visit our Register Now page to use the PayPal button for the $15 CD only order. Remember, the programs on the CD and web site are identical, so you can always download the latest from the web site anytime, without the need to purchase another CD or any additional charge! No, you can continue to use the original call sign / password combination when installing the programs and then operate under your new call sign. You may install and use the Field Day Contest Log on multiple computers at one Field Day site with one registration. Please keep the password confidential for club use only. In addition, please uninstall the program from any PCs that do not remain at the club facility after the contest. No, a club registration is only for use at the location of a club station. Providing club members registration numbers for their personal use is NOT allowed under our registration policy. This is a violation of our agreement, it hurts our business and our livelihood. Since 1997, we have kept our one time registration fee low and we've provided countless free upgrades. To continue our current, free upgrade pricing policy, we are counting on the honesty and integrity of clubs to maintain the strict confidentially of club passwords. You'll find our refund policy, which is also linked from the bottom of every purchase page, here. I have a list of step by step instructions on the Installation Tips page. Please click the link for complete details. You'll find the instructions at the bottom of the Installation Tips page. - Export your data in ADIF Format from your old log. - Note the location of the .adi file you just created from your old log. - From the menu options click File > Import ADIF Format. - Navigate to the .adi file location. - Double click on the .adi file and your log data will appear in the List Box on the main form of Amateur Contact Log. Please Note, after you import your ADIF file into AC Log and your log data is out of order, parts are missing, etc., the log you transferred the data from was not using the standard ADIF format. You can sort your log by clicking File > Sort Log on Date. Many of the missing data fields can be filled by clicking from the menu options Edit > Fill Fields Determined by Call. If you continue to have trouble, please send us an e-mail with the .adi log file attached, and we will be happy to take a look. I have prepared a simple Excel spreadsheet that will help you convert the data for import to the 3X versions of AC Log. If you are running AC Log 4.0 or later, you'll have to download AC Log 3.4 from the archive page, bring in the data and then export it in ADIF to transfer to AC log 4.0 or later. Please click here to download a copy of the spreadsheet. All our programs will run on Windows XP (with service pack 3) and later Windows operating systems (including Windows 7, 8 and 10). I've had excellent reports from Mac users running Parallels, versions 9.0 and later! Folks generally don't wish to download the entire suite at once because it includes many "in state" QSO parties, only one of which is generally useful to any given user. Users prefer to choose which programs to install as the contests they are interested in approach. Additionally, since upgrades are free to registered users, it is a good idea to download the software for each contest a week or two before the contest date, so that you are sure you always have the latest version. Your Internet protection software is very likely returning a false positive. Unfortunately, every time I upload a program, even if the version number has not changed, several Internet protection packages, including Symantec (Norton) always default to a positive, simply because the file is new. Then they wait for thier users to submit the file before evaluating it. This occurs even if the change is nothing more than a newer country list. I've personally scanned the file with both Avast and Windows Defender with clean results. Following your submission, after a day or two, Symantec should update their definitions to allow you to install the software. Another user writes that he was able to go into Norton's “Reputation” settings, looked at the description and followed their solution for a “known good source.” In doing that he was able to download the file with no problem. Even if you go this route, I would still really appreciate it if you would take just a moment to report the false positive to your Internet protection software vendor. - From the menu options click File > Write Cabrillo (Contest Submittal) File. - Complete the form that appears. Note that this a a generic form used in all my programs, so you can just leave any fields not applicable to this contest blank. Don't worry, the contest robot will let you know if there is anything missing. - Click the button at the lower right to write the file that says Write Cabrillo Summary File. - The program will create the file, tell you the file name and where it is written. Make a note of the file location. - Using your web browser, navigate to the contest sponsor's log submission web site or start your e-mail client, address your e-mail as defined in the contest rules and attach the file that you created. - The file name that you should submit will be the one that begins with your call sign. If for any reason you wish to edit the file before submitting it, you can open it with Notepad or any text editor that does not introduce formatting characters. First, don't panic. This is almost always easily correctable and you can resubmit your log file as many times as needed. The robots are actually quite helpful in explaining the problem for most contests. Please take a deep breath, relax, carefully read the robot's detailed reply and correct the error. Then recreate and submit your Cabrillo log file as detailed above. - The log was not submitted in Cabrillo format. Remedy: Make sure you e-mail your log file that begins with your Call Sign following these steps. ADIF files are not sent for contest submittal. - An operational category was selected that is not valid for this contest. Remedy: carefully review the rules for this contest and enter a valid category on the Cabrillo form. - The robot doesn't recognize what appear to be correct values. Remedy: It is likely you left a required field blank in Setup or on the Cabrillo form. Make sure all the Setup fields have proper values, recreate and submit your Cabrillo log file. - The QSO date is outside of the date range for the contest. Remedy: Make sure all the contacts you submit are within the contest time window. If your PC clock was set wrong, you will have to edit the contacts individually to correct the date (sorry, there is not a bulk date edit feature). - The Cabrillo file you submitted has unexpected carriage returns. Remedy: The file created by my software is formatted properly, but if you opened it in a text editor that introduces carriage returns, that will create a problem. Recreate the file and submit it again. If you must edit it, use Windows Notepad. With the versions of my software released after June, 2016, with the API server enabled in Amateur Contact Log 5.6 or later (Settings > API > TCP API Enabled), from the contest software's menu options, just click File > Transfer via API. - From the contest log menu options click File > Export ADIF Format. - Note the .adi file location. - Double click on the .adi file and your contest data will appear in the List Box on the main form of Amateur Contact Log. In addition to transferring your contest QSOs to AC Log after the contest, also keeping a permanent copy of your contest file is a really good idea! That way you can easily load your past contest logs to look back and see how you did in previous contests with different conditions, antennas, what bands were in at what times, etc. With the new versions of my contest software, just click File > Save As and give the file a name you can identify. For example, for CQ World Wide SSB in 2018, use something like CQWWSSB2018.mdb. I'm using Vista / Windows 7, and I can't find the ADIF/Cabrillo/Other file that I formatted for contest submission? This FAQ only applies to the old, VB6 versions of my software released before 2012. The latest versions of my software have all been updated so that your submission files are output to locations compliant with Vista, Windows 7 and later operating systems and are much easier to find. If you are still using the older, VB6 versions of my software with Vista and Windows 7 or 8, after navigating to the program directory where you saved the file you created, you must click on the Compatibility Files tab to see the file. Vista and Windows 7 or 8 actually store the files in a “Virtual Store” under the AppData store in your user folder. Fortunately, you don’t need to hunt around for the files, just turn on “Compatibility Files” in Explorer. When you browse to a folder that has these hidden files, you’ll see a Compatibility Files toolbar button. Clicking it will show the virtual files for that folder. Keep in mind, though, that the files won’t show up in Open and Save dialogs. Since various contests have different Cabrillo output format requirements that are contest specific and because AC Log is designed with general logging in mind, AC Log doesn't have a Cabrillo output function. All my contesting programs will of course generate the appropriately formatted Cabrillo files designed specifically for each contest. I've not tried them myself, but I understand there are ADIF to Cabrillo conversion programs available. If you find a conversion program that supports the contest for which you would like to submit, from AC Log, select the records you would like to submit for the contest, click File > Export ADIF and export the contest related records. Then use the ADIF to Cabrillo conversion program to prepare your Cabrillo file. It's not necessary to convert cut numbers to numeric values, since the log checking software will perform that function for you when you submit your Cabrillo file. Please see the Operating Tip section in the ARRL Contest Update on 1/28/15 for more details. Watching everyone's score in real time is a blast! Whether you have serious competition in mind or you are just playing casually in the contest, please enable the Score Distributor. It's free! Just click Settings > Web Contest Upload Status > Other Online Sites. Then check the first Enabled check box on the left. That's all there is to it! Yes! Like the ARRL's Centennial QSO Party in 2014 and the National Parks on the Air (NPOTA) event in 2016, scoring for ARRL's International Grid Chase is handled by ARRL's Log Book of the World (LoTW). Amateur Contact Log worked just fine for the ARRL Centennial QSO Party, NPOTA and it will be fine for ARRL's International Grid Chase in 2018 too. Grid Chase scoring is handled by upload to LoTW and Amateur Contact Log has all the features you need for that. To keep your Grid Chase score updated, you only have to upload the Grid Chase QSO to LoTW, just as you would any other QSO record. You don't even have to log the grid! LoTW will determine and confirm the grids you work based on the LoTW records of the stations that confirm on LoTW. You can see the Grid Chase leader board here. It isn't necessary to track the grids you work in AC Log since LoTW is performing that function, but you can always display the grid field to do that too if you like. To display and customize the location of the grid field, click Settings > Edit Fields Displayed. To see your AC Log grid total, just click Awards > 10-10, Grids, Etc., enter the starting record for the time period of interest, enter an L in the Confirmed By field (to only return QSOs confirmed by LoTW) and then click calculate. In summary, to participate, just make as many QSOs as you can! No specific exchange is required and contest contacts count too. Then upload your QSOs to LoTW! The short answer is no, my software isn't set up to log multiple contests with a single program. My goal has always been to create individual contesting programs that are easy to use, do one job and hopefully do it well. My software is set up to display lots of real time data during the contest, including your valid QSOs, current score, multipliers which change color or are listed when worked, etc., as well as making your contest submittal a snap after the event is over. You'll find more details on the complexities and challenges of creating contest specific software here, but briefly, each contest has its own exchange, multipliers, point values, Cabrillo summary format and scoring rules. Even with contests where the exchange and point values are identical, adding additional multipliers to a multiplier list that aren't really eligible for a specific contest would cause the software to list those multipliers, count them in the scoring, etc. and effectively break the functionality of the software. It would become misleading and confusing to use the program, since the multipliers needed and worked lists would be inaccurate and it would render the score calculation inaccurate as well. For all these reasons, as well as the fundamental coding design considerations under the hood, there isn't a way to log multiple contests simultaneously with a single program. I don't have any plans to create a "generic" program at this time. To participate in multiple contests, you can run both contesting programs simultaneously. Just bring up the appropriate program for the QSO you want to log by clicking on it in your Windows task bar. Also remember that you can have multiple programs connected to your rig simultaneously by enabling the N3FJP API on the program connected to the rig (Settings > API) and then using the N3FJP API selection on the rig interface form of the second program. Yes, using the API, you can run multiple programs to access rig interface and other features simultaneously, so that they all are fully functional! Start AC Log (or one of the contest programs) and configure it normally for rig interface. Then, from the menu options click Settings > Application Program Interface. In the form that appears, check the upper check box to enable the server. Leave the lower check box unchecked. Start the contest program(s), click Settings > Rig Interface and select N3FJP API from the rig list. Click test and your contest program(s) will follow your rig via the API, just as if they were connected directly! You can also configure your contest programs to send CW via API as well. All of my contesting software is contest specific. Each program is specifically designed with one contest in mind. You are of course free to use the programs for any contests that you like, but finding an existing program that will support another contest will be quite difficult. Even if you find an existing program with an identical exchange, there are other parameters you'll have to check as well. For example, are the points counted the same per mode? Do you work the station once, once per band, once per mode or once per band and mode? Will the existing program create a Cabrillo file that the contest sponsors for the other contest will accept? What are the multipliers - states, sections, countries, counties. etc? Are multipliers counted once, once per band, once per mode, or once per band and mode. The list goes on! As you can see, there is a lot more that goes into preparing Amateur Radio contesting software in addition to logging a specific exchange. I'm doing my best to create contest specific applications that each perform their intended function very well, so they generally are not adaptable to other contests for which they were not designed. If there is a contest that you are interested in that I currently don't support, please touch base and let me know. One of the criteria for adding contests to my future projects list is the amount of interest users have for a particular contest! With the latest versions of my state QSO party software, just type a + and then type the second abbreviation before pressing enter. - Type the exchange for the first county and press Enter (note, for the PA party, be sure to enter EPA or WPA). - From the menu options, click Recall, or press Alt R.
- Type the new county. You'll find all the upgrade steps here! Go ahead and download the installation file for AC Log, install it and then enter your password. From the old computer click File > Export ADIF. Write the file to an accessible location to all PCs on your home network, or to a portable storage medium and take it to your new computer. From the new computer click File > Import ADIF and select the file. If you would like to also transfer your customized settings, click here for those details. From the computer with the most recent data click File > Export - ADIF Format. Write the file to a data storage device and take the device to the computer with the older data. From the "old data" computer click from the menu options File > Reset Counter, and enter a value of 0. Then click File > Import - ADIF Format and select the file on your data storage device. Yes, to start a new log file, from the menu options click File > New > Start a New Log with a New Database File. Your previously opened log file will be fine. Just be sure to give your new file a new, valid file name (don't uses slashes or other invalid file name characters in the file name). You can always open any of your log files by clicking File > Open, navigating to them and selecting them. Yes, there are two alternatives. If you all share the same Windows user sign on, you can click File > New and select the New Database option to create a new log for each ham in your family. 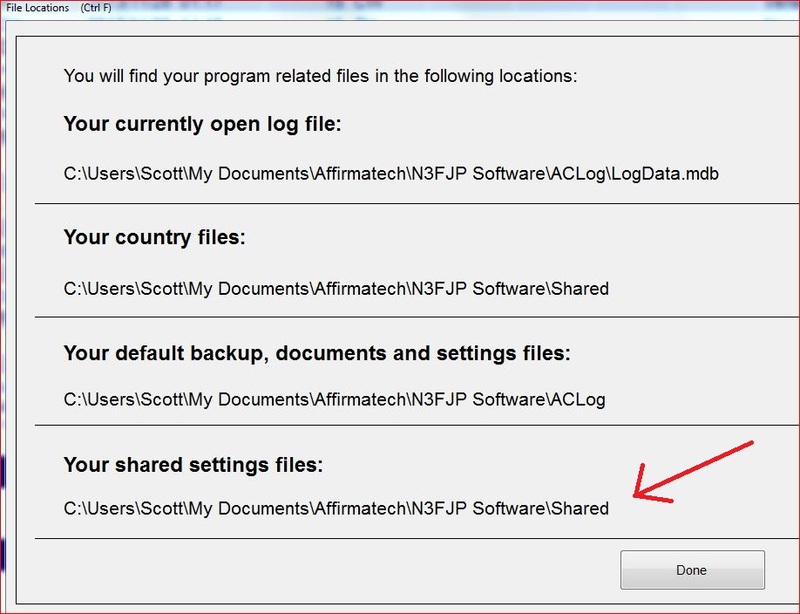 Each log file is independent and each user will simply click File > Open and select their personal log file. The problem with this approach is that all the user settings, including LoTW settings, are shared among all users, each individual won't be able to customize AC Log without changing the appearance everyone sees and everyone will have to be careful to enter their personal settings on the LoTW form before uploading to LoTW each time. The better approach is to give each family member their personal Windows user account. That way, AC Log, the log file and all the individualized settings are saved in each family member's personal user settings. It will be as if each family member has their own personal copy of AC Log, all on one PC! By the way, one registration is fine for your family. To sort your log file on date, from the menu options click File > Sort Log on Date. This will bring your most recent records to the top of AC Log's main list. From the menu options click File > Export - ADIF Format; navigate to the data storage device and click Save. From the menu options of AC Log or any of the newer contesting programs click File > Show File Locations. Using Windows Explorer, save the graphic file in your shared settings directory with the file name splash.jpg. After you save the file to the proper location, it will display during load each time you start the software. You'll need to first open your old log file in a 3X version of AC Log and then export it in ADIF (click File > Export ADIF) for import into the current version of AC Log. You'll find AC Log 3.4 archived here. The software will always attempt to load the file used during your last session (assuming you have not moved your log file) on start up. For the software to automatically open the log file you used during your last session and access your registration information (password) on startup, you must sign on to Windows with your usual user profile, or as Administrator if that is how you have been running the software. Your last used log file is likely fine (as are the backups you've enabled), but the path to your log file resides in your settings files. If you start the software with a different Windows user profile, it won't have access to your last used path and settings, so it won't know where to look for your log file. If you signed on to Windows with a different user profile, AC Log will start a new log with that profile and prompt you for your password, but your log that you created under your previous Windows user profile should be fine. Just click File > Open, navigate to where you have been saving your log file and select it (or restore from your backup folder if necessary). To see the location of your currently open log file, click File > Show File Locations and note the file path. It is typically something like C:\Users\YourWindowsUserProfileName\My Documents\Affirmatech\N3FJP Software\ACLog\LogData.mdb. Of course, all your backups and settings files are stored in the Windows user profile path that you have been previously using when you run the software as well. Another possible cause for your log not loading is that you manually deleted the Settings.xml file from the program's Documents folder in your My Documents directory, or the log file itself from where you were saving it. If that is the case, enter your password and then click File > Open, navigate to your log file and select it. If you need to restore your log file from backup, please see the next FAQ below. Still another possible cause is that your Virus protection software has updated and is no longer allowing AC Log to access its settings or log file. If so, allowing AC Log proper permissions in your virus protection software will do the trick. For AC Log, please continue. For restoring from backup from a contest log, please go here. The best restoration approach is the one that uses your most current, up to date backup. If you've simply imported or entered unintended data and that data all has the highest record numbers, simply click File > Reset Counter and enter the value of the last good record. - If you have the Backup on Close option enabled, a backup is created every time you close AC Log. You can click File > Backup Options to see the path where you have been saving that backup. Using Windows Explorer, copy that file to where you want to keep your log. Then, from AC Log's file options click File > Open, navigate to the file and select it. - AC Log also makes a backup once a week automatically by default. You can determine the location of the Backup folder by clicking File > Show File Locations. From AC Log's file options click File > Open, navigate to the Backup folder, find your most recent backup file and select it. Then immediately click File > Save As and save the file where you want to keep your primary log file with the file name you wish to use. - If you don't have any backup files, as long as you have been uploading to Log Book of The World, you can still restore your log that way. From the LoTW form in AC Log, click the button under the Download heading that says All Data. Any records not currently in your log will be added. Actually, this question is almost never asked, and then only after data loss has occurred, but is it something for all of us to prepare for. Hard drives fail, RF / power surges get in the shack and corrupt files, Windows updates go awry, viruses invade, PC cleaners "clean" too much (I've had multiple reports of "Cleaners" eating log files over the years), components of our operating systems fail and human errors happen. Over the long haul, without protection, data loss is an inevitability. The best way to protect yourself from data loss is by backing up your data often, ideally to an external medium. Both AC Log and the contesting programs offer several automatic backup options that you can configure by clicking File > Backup Options. AC Log creates a backup of your data automatically, once a week by default and also includes an option to save a backup every time you close it to a location of your choice. To fully protect yourself from data loss, I strongly recommend you enable the backup on close option and choose an external medium such as another location on your home network, thumb drive, etc. With this enabled to an external medium, even if the PC hosting your log file totally fails, you can be sure that the worst case scenario is only losing a day's worth of data, not a lifetime of logging. Please take a minute now and plan a sensible backup process for your data! This video details setting up DX Spotting, including setting filters. You can filter by continent right from my software's DX spotting form by selecting the continents you would like to see. This is useful for contests geared towards specific regions. With AC Log 4.8 and later, I added additional filtering you can set by clicking the More Filtering button on the DX Spotting setup form as detailed in the video above. For even more specific filtering, most DX Spotting telnet hosts provide a variety of filtering options. This DX Spotting web site manual details how to configure your DX Spotting telnet host to your preferences. Specific filtering options are detailed here. Complete details on setting up the DX Spotting band map display are here. The VE7CC user program can act as a server for DX spots. You can connect to several DX Clusters and skimmers, combine the spots, remove dupes and then send them to a program such as N3FJP's logging program. To do this you enable the user program's server function by going to Configuration > Ports / Logging program. You then enable incoming Telnet. The default is port 7300, but you can change it if you want. You then tell the N3FJP program to connect to the local server at IP 127.0.0.1 port 7300. If you need to tell the N3FJP program a call for this connection, just call it VE7CC or whatever call you want. Once this is working, you can use the "get" function of the user program and the resulting spots will be forwarded to the N3FJP program. With several sources connected to the user program , the call the user program forwards commands to will be the one in the cyan colored box. To change sources, just click another call and it will change color to cyan. - Click Settings > DX Spotting > Configure (just Settings > DX Spotting for contest programs) to display the set up form. - At the upper right of the DX Spotting form, click the Enable DX Spotting check box so that it us Unchecked. - At the upper left, click the drop down arrow under Telnet Host and select a different DX Spotting telnet host, or type in any host you like (here are more than 600 to choose from). If you use a different host from one of the drop down options, make sure you enter the correct port as well. - At the upper right of the DX Spotting form, click the Enable DX Spotting check box so that it us Checked. You should start to see DX spots come in. If you don't, try a different host. If you have any trouble selecting a different telnet host, please watch the opening moments of this video (beginning about 50 seconds in) for a step by step tutorial. By the way, I am not directly affiliated with any of the DX Spotting telnet hosting sites, so I am unable to expedite its repair or advise you of the repair status. If your preferred telnet host remains down, rather than e-mailing me, please contact the telnet host provider directly for status updates. From Amateur Contact Log's menu options click Settings > New Contact & QSL Alert Options > Alert if New on Current Band and Mode. Do your programs support the ARRL's Log Book of the World? Yes, the Log Book of the World uses either ADIF or Cabrillo format. All of my software will export in either one or both of these formats. In addition, ACLog will upload, download confirmations from LoTW and update your log file automatically. For more information on LoTW, please click here. Yes, the Log Book of the World uses either ADIF or Cabrillo format. All of my software will export in either one or both of these formats. Immediately after you upload to LoTW, nothing is changed in your log. The TQSL software may have had a problem signing your records or LoTW may not have received or processed them properly. To ensure your records have been received by LoTW, your records are not marked as Sent with an L in the Sent Confirmed By field until you later download the records that you uploaded. Please keep in mind that when LoTW is busy, uploads are held in queue and aren't immediately available for download. Don't panic if the records you recently uploaded aren't available for download yet. Don't upload the same records again because your previous records are replaced and the cycle starts all over. Instead, wait a while and then click the command button on the LoTW form under Download that says All Since and enter a recent date. Once your records are processed by LoTW they will be available for download. After you download your records from LoTW, your log records will then be marked with a Y in the Sent column and an L in the Sent Confirmed By column to indicate sent confirmed by LoTW. If the contact has also been confirmed on LoTW, the Received columns will be updated accordingly as well. If there are some gaps of unmarked records in your log, you've probably been downloading Confirmed Since or All Since before LoTW finished processing an upload. Click the All Data button under the Download heading on the LoTW form and all the records you previously uploaded to LoTW will be marked appropriately. Your TQSL software actually does the upload, so it is not surprising that uploads can work when downloads won't, since your user name and password values are only referenced when downloading. In 99.99% of cases, the problem is that you have mistyped your LoTW user name or password (typically the values you use when signing in to LoTW on line). It is very common for folks to emphatically assure me that they have typed their LoTW user name and password in correctly, only to discover, after trading multiple e-mails, that they did not enter correct values after all. It could be a mistyped character, the wrong case, or even just a leading or trailing space in the field. Unless something external to AC Log is blocking the download, everything related to downloading from LoTW is on the LoTW form. Please try clearing out your existing user name and password values and then carefully type them in again. Also please be aware that ARRL made a change in September, 2016 that now enforces case sensitivity. Be sure to select an LoTW password that only uses letters and numbers. Stay away from special characters such as (@, !, #, etc). If you don't see something like the above, but rather web page HTML, the most likely cause is that your LoTW user name and / or LoTW password are incorrectly entered. Correcting the information entered as detailed in Steps 1 and 2 here will do the trick (also, make sure you don't have any leading or trailing spaces in your user name or password). If that doesn't correct the problem, carefully follow all the remaining steps detailed here. Steps 1 through 6 are the only LoTW download related settings in my software. There is nothing else to change or check. If you are still having trouble, something external to AC Log is at play. The most likely possibility is that your Internet protection software is blocking AC Log from accessing LoTW. Giving AC Log the proper permissions in your Internet protection software will correct that. For all the LoTW setup steps, please click here. Please note that the TQSL program can map the modes in an ADIF log file that aren't valid to modes that are valid via the File menu Preferences command (use the ADIF Modes tab). The duplicate QSO message is not generated by AC Log. It is returned by the TQSL software when it receives records it has previously signed. After a successful download of the pertinent records that you've previously uploaded to LoTW, AC Log puts an "L" in the Sent Confirmed By field and won't attempt to send the same records to TQSL for upload again. You can usually stop this message from appearing by clicking the All Data button under Download so that all your records are marked appropriately, following a full download from LoTW. If for some reason one or more records still aren't marked with the L in the Sent Confirmed By field after downloading All Data, you can mark them manually, either individually from the Edit form, or by multi selecting the records from the main form with your mouse, while holding Ctrl or Shift. Then click Edit > Marked Selected Records as Sent from the menu options. Alternatively, simply continue to click the Exclude Duplicates button with future uploads. Yes, the optional password prompt is actually generated by ARRL's TQSL software, not AC Log. You'll find the step by step details on how to disable the TQSL password prompt on ARRL's site here. The QRZ Online Callbook option is not included with the free QRZ membership and services. This is a subscription service offered by QRZ. Please click this link for more information http://online.qrz.com/. Also, please be aware that after your QRZ subscription or trial has expired, QRZ will only return the name until you renew your QRZ subscription. Yes, after you copy your data to the hard drive, from AC Log's menu options click Callbook > Hamcall Buckmaster CD and enter the designation of your hard drive. Don't type any other characters such as a colon or backslash. Just enter the letter such as "C" (without the quotes). Yes, copy the entire folder CALLBK from the QRZ CD to your hard drive. AC Log will then find the data. The folder on your hard drive containing the data must be c:\CALLBK. Also, if you would like to see the full address appear in the Comments field, from AC Log's menu options click Callbook and make sure Place Retrieved Address in Comments Field is checked. If you want a "hard copy" of your contest log, you can print the Cabrillo, ASCII or data file you created for contest submission by opening the file in a text editor such as Notepad and clicking File > Print. - Open AC Log or the contesting software. - For AC Log, select the records you wish to use for the award (Hold Ctrl or Shift & click). - From AC Log's menu options click Edit > Copy Current List OR Edit > Copy Selected Records to the Clipboard. - For any of the contest programs, click All above the list box. Then click File > Copy Listed Items to Clipboard. - Open a spreadsheet program and click Edit > Paste from the menu options. You can now format and print the data in any way you like using the spreadsheet program. 1. A rear feed printer that will feed the QSL cards straight through the printer without curling them. 2. Non-glossy coated QSL cards that you can print on. The ink needs to stick and bond to the card without smearing. 1 How many label rows are on each page (top to bottom)? 1 How many label columns are on each page (left to right)? When printing, you will need to go into printer properties and change the printer page size from standard 8.5 inch by 11 inch to 4 inch by 6 inch postcard size. If printing to a 3.5 inch by 5 inch postcard, the left margin settings may need to be slightly adjusted. Not all printers save the post card settings. My HP Inkjet needs to be reset to Postcard setting each time I print a batch of QSL cards. Be careful of jamming. QSL cards are card stock material and some rear feed printers can only take a certain quantity of cards in the feed tray. Test out the settings above using cheap scrap paper before printing onto your nice QSL cards. The left margin may need slightly altered for your specific card size. All other values should be good. If any of the fore colors you have selected are the same as your list's back color, those QSO records will appear blank. From the menu options click Settings > Appearance > Colors and Fonts and choose fore colors that are different from your list's back color. The bearing and distance works best for DX. With versions 1.8 and later, I have included the latitude and longitude of the state capitals so, when you enter the state, the calculations should reflect the bearing and distance from your QTH to the state capital. Additionally, Jim's country files now include the Lat & Long for some US call areas. Click View > Country List to see which ones. Also, some of the callbook lookup options return Lat and Long and AC Log will use these values to calculate bearing and distance. In addition, if you are recording the grid square, the bearing and distance will update based on the value you enter in the grid square field. So, in short, as long as you are accurately providing both your Lat / Long as well as the station you are working's Lat / Long, the values should update accordingly, but if the data source for call book lookup isn't returning that data (not all services have the data for all contacts), there is no way for AC Log to perform the calculation. I've rearranged the list column heading order and changed some of the widths in AC Log. How do I save these changes? For AC Log 4.0 and later, your changes will be saved automatically on exit. For the 3X versions, once you have your column order and widths the way you like, click Settings > Save Current Column Width and Order. For best results, you should have the date format for AC Log and the date format for your operating system set as close as possible. To change your AC Log Date Format click Settings > UTC QTH & Date options (YYYY/MM/DD or your Windows Regional Settings are recommended). To set your operating system format click Start > Settings > Control Panel > Regional Settings > Date. That will help AC Log and the operating system understand each other. When the mode is filling automatically, you have enabled rig interface and the mode is being returned from your rig. If the mode being returned is not the mode you want, click Settings > Rig Interface. Then either correct your rig interface settings, disable rig interface by selecting None from the rig list, or select the Don't Use option under Mode Determined By on the rig interface form. Keep in mind that if you have a quick entry, you can always press Ctrl+Shift+R to temporarily disable rig interface. The new versions of my software read the UTC time directly from your Windows operating system. As long as you have your time, time zone and day light savings time adjustment properly set in your Windows OS, the UTC will be correct. You'll find this answer in the announcement I sent out explaining how to configure AC Log during W1AW's Centennial Celebration for those operating as W1AW/X as an example. In addition to those configuration details, of course you can always customize AC Log's data entry fields how ever you like by clicking Settings > Edit Fields Displayed. This video created by Richard, K0PIR demonstrates setting up and using phone audio wave files running Windows 10. Note that it isn't necessary to set up rig interface to play phone audio wave files, but you do need an audio interface such as the SignalLink device demonstrated in the video above. - From Amateur Contact Log 5.6 or later click Settings > API and check the upper checkbox that says TCP API Enabled (Server). - From the contest software click Settings > API, check the lower checkbox to Enable Entity Confirmation Check via API. - Click Settings > Rig Interface and configure the rig interface settings for your first rig. - Click the Save Settings button below the rig list and give the file a unique file name. - Repeat for the second rig, giving it a different file name from the first. - Then select both files from the multi radio configuration settings section (at the bottom left) for SO2R. - From the main form, just press Ctrl X to quickly switch from one rig to the other. Yes, here is a quick start video I created with folks brand new to Field Day in mind, covering the very basics of my Field Day software. It is a good introduction for the rest of my contesting software too. You'll find all the step by step networking details here. These steps apply to AC Log and the rest of my contest software too! If you are not networked during the event and have multiple logs to combine, from each of the other PCs click File > Export ADIF and take them to the PC on which you are combining your master log. On that PC click File > Import ADIF and select each of the ADIF files. Then click File > Remove Duplicates (if you wish) and then click File > Sort Log on Date. Make sure that you back up these files from each PC before you begin combining them! Also, don't merge the GOTA station QSOs into this file. GOTA contacts are added separately. That said, networking your Field Day set up really is the way to go. You will have a lot more fun seeing your team's combined score update in real time, you'll be able to allow each transmitter to operate on any band / mode combination without worrying about duplicates, etc. As you can probably imagine, as Field Day approaches, I receive tons of requests from folks who are attempting to set up their networks, enable sharing across multiple platforms, different routers and other hardware, etc. While I'd love to be able to help with that, my knowledge is geared to programming, not networking, hardware or operating systems and I'm by no means an expert in those areas. I simply don't have the time or expertise it would require to support all the network / OS setup questions that come my way. That said, it's generally very easy to set up a network and it is well worth it. Using the network features of my software will definitely add to your Field Day fun! My networking software has been used successfully for years on a variety of Windows operating systems (I'm not aware of any combination that will not work from Win 95 on up, though you must use at least XP with SP3 with the newer versions 4.0 and later). - Set up your network (you can Google "Set up home network" for all the information you need to get you going). - Put the LogData.mdb file in a folder that is accessible to all the PCs on the network. Tip - with later operating systems, groups often find it easier to attach and share an external hard drive or thumb drive to their server, than share their server's C drive. - Make sure the Field Day software is pointing to the correct log file by clicking File > Open, navigating to the file and selecting it. - Make sure that your Internet / Virus Protection software is allowing the program to communicate. - Enable permissions to Update (not just read) on the drive, folder and log data file. Your GOTA station has to be operated under a different call, so its contacts are kept separately in its own log file and should not be connected to the log file of the other stations (or merged via ADIF afterwards). You'll just keep the GOTA log separate and add the GOTA totals when you submit your entry. 1. Start the Field Day Program. 1A. If you were not networked during the event and have multiple logs to combine, from each of the other PCs click File > Export ADIF and take them to the PC on which you are combining your master log. On that PC click File > Import ADIF and select each of the ADIF files. Then click File > Remove Duplicates (if you wish) and then click File > Sort Log on Date. 2. From the program's menu options click File > Write Cabrillo File. Complete the form that appears (* see note in next paragraph). Then click the Write Duplicate and Write Summary file command buttons. * Please note that if you are running version 4.9 or later and you plan to submit on line (it's easier and you earn 50 extra bonus points), it is not necessary to complete the form in the program. Just click the button at the top of the form that says "Click Hear to Calculate Band Totals...". 3. When you click the Write Summary command button, you will be prompted to save the file and then given the option to view it. Click Yes to view the file. Then click the link at the lower left to visit http://www.b4h.net/cabforms/ website (you get extra bonus points submitting this way). 4. After navigating your web browser to http://www.b4h.net/cabforms/, click on the ARRL Field Day entry form link. Then complete the form that appears. You can refer to the summary display to quickly retrieve the information you need to enter on the web form. 5. Click the Submit Entry button at the bottom of the form. 6. Since Rule 8.4.2 requires an alphanumeric listing of calls by band and mode, you should also attach the yourcall.dup file to an e-mail addressed to fieldday@arrl.org. If you are planning to snail mail additional supporting documentation, you have the alternative of saving this file to a portable medium and including it in your packet. Also, be sure to check the Field Day contest rules for any other supporting documentation you may be required to submit for your bonus points. This video will give you step by step details on how I submitted my 2015 Field Day log. This FAQ was written with Field Day networking in mind, since insufficient permissions causes the error to appear most often under those circumstances, but the following applies to stand alone installations too. - By far, the most common cause of that error is that your security permissions are not allowing the program to access the log data file. This can occur as a result of insufficient network permissions, or the file / folder permission settings on your local drive. I have received reports of Window Updates causing your permissions to be changed in some cases. First, make sure that you save the LogData.MDB file to a drive and directory that is accessible to ALL PCs on the network, or if using a local drive, that the file and folder permissions are set to update, not just read. I do not recommend using your Program Files directory, as Windows is especially particular about allowing access there. Instead, use something like c:\FieldDay. The drive, folder and file ALL must have their permissions set to Update, not just Read and must be accessible to all the PCs on your network. In this example, your drive c, your folder FieldDay and your file LogData.mdb must all have permissions set to Update. The drive and folder must also be Shared. - Your network is having drops in connectivity. I have lots more information on remedying that here: http://www.n3fjp.com/help/networkinghelp.html. - Your virus protection software is blocking the connection. I've had user reports from folks attempting to run two different virus protection software programs simultaneously, which were in conflict with each other, preventing the connection. Disabling one of the virus programs corrected the problem. In another case, Kaspersky issued an update that affected all programs using Microsoft Access databases, including mine. Kaspersky users had to wait for Kaspesky to issue a corrected update to remedy that situation. - There have been a few other, very rare reports, which I've been documenting half way down this page here. Note - the following applies to Field Day Contest Log 4.7 and later (as well as the rest of my contest logs released after January 2015). For earlier versions, to retrieve your backup file, click File > Open instead of File > Import ADIF. For AC Log, please go here. As long as your 15 minute backup option is enabled (click File > Backup before the contest to ensure that it is), you will be able to quickly restore from backup. The backup file is an ADIF file, updated every 15 minutes, containing a complete record of your log. A backup is also created each time you close the software by default. It includes data added from all the PCs on your network that were connected to the master log file on the server. To restore from a contest log backup, first, from the menu options, click File > New > New Database to create a new, empty file (or click File > Open and select a blank file if one already exists). Then click File > Import ADIF, navigate to your most recent backup file and select it. Your data should now reappear. If you wish to resume networking on a new PC and share the file that you just restored from backup, from the PC with the most recent backup, click File > Save As and save the log file to a location that is accessible to all the PCs on the network. Then, from each PC, click File > Open, navigate to the new log file location and select it. My software will not share ports with other programs or even different functions within the same program. For example, if you are using com port four for rig interface, you'll need to select another com port for CW sending in the software (and of course connect your CW interface to the com port selected for CW). Your CW sending interface and your rig interface are two different devices and each will have to be connected to a different port. If this is the error message you are seeing, it is because the com port is already in use by another program. Whichever program you open first takes control of the com port. No other program / function will be able to access it until the resource is released by the program that controls it. Most folks (including me) use USB to serial adapters for each port function, but I've also had good reports from folks using a single port and com port virtualization software, which will split a phyiscal COM port into multiple virtual ones. My software lists all the com ports that Windows recognizes as working properly. If a com port is not appearing in the list on the set up form, go into Windows Device Manager, make sure the com port is listed there and that there isn't a yellow exclamation point beside the port, indicating that the port is missing a driver or not functioning properly for some other reason. Once you have the port working properly in your OS, it will show up in the com port list in my software. Also, make sure you actually click on the port in the drop down list to select it. Would you mind if I put a link on my website to your site http://www.n3fjp.com/? We would very much appreciate it! Most of our customers find us by hearing about our software from other satisfied customers. Fldigi Support: here. Documentation: here. Widely used software that supports many digital modes. JTAlert Support: here. Digital bridge software emphasizing JT modes. N7YG Digital Engine Support: here. This program was specifically designed by N7YG to function as a companion to the suite of N3FJP software and provide a simple digital modem with a floating waterfall that can reside on the same screen as the logging software. PSK Express Support: here. Supports a variety of digital modes including RTTY, etc. W4ELP Lookup Utility. Support: here. Interfaces with DM 780 - including the free version. Win4K3Suite Support: here. Rig Interface for Elecraft radios. WSJT-X via JTAlert. WSJT-X a very popular, free program for FT8, JT65, JT9 and other low power digital modes. For digital, please try all the options, even if you are more familiar with one than another. There are some differences that may make one more appealing. You may find one works better for contesting and the other for general rag chew. Developers often add upgrades based on feature requests from their users. It may be your prompting that makes the difference! Another alternative, if you use a different digital program, is to simply log your contacts in the digital program when you are operating digital and then transfer your contacts to AC Log via ADIF. Keep in mind that depending on the contest, some programs assign QSO points and other multiplier data on entry and the score may not be correct, but the log checking robot will rescore your log, so send it in anyway! You'll find more details on configuring some of these programs with my software here! Yes, you'll find quick start guides for interfacing Fldigi, PSK Express, JT Alert and more with my software here! Since QRZ already allows you to link your LoTW uploads to your QRZ account, I'm not planning to also add direct uploads to QRZ at this time. You'll find all the details on linking your QRZ account with the data you've uploaded to LoTW here. Once configured, your uploaded records are also linked to QRZ when you upload to LoTW! Of course, another alternative is to easily upload your log to QRZ by clicking File > Export ADIF, exporting the records you want to send to QRZ and then uploading from QRZ. Hi Scott, I understand your reluctance to include rotor control and with further Internet search, I've found a program (PstRotatorAz) written by Codrut Buda, YO3DMU that works perfectly with all of your logging programs. The program grabs the entered callsign and does either a locator or callsign prefix lookup from QRZ.com or most other available databases including it's own internal lookups and automatically positions a supported rotor controller to the right heading. His registration fee is only 15 Euro's and for what the program is capable of this is cheap indeed. Just thought I'd let you know in case you get other requests for the inclusion of rotor control in your loggers. The latest PstRotatorAz program version is able not only to take the callsign or locator information from AC Log and based on these to calculate the heading and rotate the antenna, but it is able now to take the frequency and tune a SteppIR or Ultrabeam antenna, or switch the antennas using for this various relays boards. To interface AC Log with PstRotatorAz select in PstRotatorAz "N3FJP's loggers" as Tracker, and set the "Tracking" mode. My software will work fine with any value in the Operator field, but some services, such as QRZ, will only accept valid call signs in the Operator field. Changing your name to your call sign in the records you wish to upload to that service will correct the problem. If you wish to fill missing fields that can be determined by the call sign that are currently blank, click Edit > Fill Fields Determined by Call. - Backup your log file (Click File > Create Backup and enter a file name for your backup file that is different than your currently open file). - Click File > Export ADIF > Whole Log. - Start Notepad, WordPad (or ADIF Master - see below), navigate to the ADIF file you just exported and open it (don't forget to change the file type filter to all file types so you can see and open the file). - From Notepad or WordPad's menu options click Edit > Replace. - Enter the value you want to change in the Find what field, such as <OPERATOR:5>Chris. - Enter the value you want the old value to become in the Replace with field, such as <OPERATOR:6>KB3KCN. Don't forget to change the ADIF length designator if necessary! - Return to AC Log. - Click File > Reset Counter and enter 0. - Click File > Import ADIF and select the file. The changes you made will now be reflected in your log. I've not tried it myself, but another option that will likely be easier if you have extensive editing in mind and that comes highly recommended by many users is ADIF Master. ADIF Master will open and modify existing ADIF logs using customizable filters, add, remove and modify ADIF tags and entries. Just follow the steps as detailed above, but instead of using Notepad, let ADIF Master do the editing for you. Absolutely not! You can enter any mode you like! The mode drop down list isn't user customizable, but you can type any mode you want in AC Log's mode field. In addition, AC Log will default to the mode value you entered in subsequent QSOs (with rig interface mode return disabled). AC Log will pass any mode you enter to ARRL's TQSL software for signing and upload, but keep in mind that as new modes come to life, it sometimes takes a while before TQSL / LoTW will accept them. If you receive a mode error when you attempt to upload to LoTW, that error is being returned by the TQSL software, not AC Log. The LoTW folks will have to address that. Kraig, KA2LHO writes: I have provided detailed instructions for those who participate in the WWFF-KFF program (I am the USA National Coordinator for that program) to modify their Amateur Contact Log configuration to include the required fields for direct ADIF export with no changes needed for the WWFF Log system and it also includes the Park 2 Park log entries as well." Don't forget to enter your call sign in the Operator field after clicking Settings > Setup. Please see their site for additional details and files referenced in the link above. Yes, below is the list for AC Log. Many of these apply to the contest software as well. CTRL+Shift+P Hides option to display passwords for LoTW, Club Log and eQSL (AC Log only). Use from main form. CTRL+Shift+S Read next serial number (for blind hams in programs released after 4/4/16 where applicable). CTRL+Shift+T Spot DX on entry (contest software only). CTRL+Shift+W CW Strings mini form. CTRL+Shift+X Clear a DX Spot from your keyboard (the call you want to clear in the call field). CTRL+Shift+Z Advance to the next DX Spot (rig interface must be enabled). Yes! You'll find all the API protocol specifications detailed here! When an external function or device suddenly stops working and you haven't changed any settings in the software, you can be sure something external to the software is at play. For Internet services, the most likely causes are the server for the service you are trying to access is down, your Internet connection is not functioning properly or your Internet protection program is clamping down on the software. If the service is down, you can just disable the call to the service until the service is repaired. For example, if QRZ callbook lookup is down, click Callbook > QRZ Internet and disable the service. After they complete repairs, you can re-enable the service. Please note that I am not able to answer support / repair time estimate questions for other services such as QRZ, LoTW, DX Spotting, etc. I am not directly affiliated with any of the services my software supports, so if a service you are using goes down, please visit the service provider's web site or contact the service provider directly for status repair updates. For hardware related devices, it could be that the cable is not seated properly, a new OS driver is required following a Windows update or the device itself is malfunctioning. Can you change the group(s) e-mail distribution list to my new e-mail address for me? I wish I could help, but list owners are not able to directly add new e-mail addresses, so I'm not able to make that change for you. Additionally, the lists have grown so large and folks change their addresses so frequently that even if I had the ability, time constraints would be prohibitive. Fortunately, it is very easy for subscribers to unsubscribe and resubscribe with their new e-mail address. Please go ahead and make that change. Yes, we have lots of written documentation and YouTube video tutorials on our Detailed Help Pages. When you first arrive at n3fjp.com, just click Help > Detailed Help Pages to go there directly. We are very eager to help, but unfortunately, we are no longer able to give out our telephone number or call by telephone. Sadly, some customers will call at any whim and it is very difficult to program with constant interruptions. N3FJP Software just consists of Kimberly and me. We don't have a customer support staff besides the two of us, so we are much more efficient by responding to e-mail at convenient points throughout the day. Kimberly and I do our best to answer all e-mail within 24 hours, but there is no way that we could do that, write software and take phone calls too. We've tried giving out our phone number on an exception basis in the past, but unfortunately some of those who said they would not continually call us have not honored that commitment. When we have made calls, folks have used Caller ID to obtain our number and then call us often (and frequently in the evening or weekends when work time is over and family time has begun). In addition, folks forget that we are on the Eastern time zone. We hit the hay about 9:00 PM but it's not uncommon for folks in other time zones to call us at 9:30 PM or later at night and think nothing of it. For all of these reasons we are unable to release our telephone number or answer telephone calls. We hope that you understand. Please e-mail the details of your problem and we will do our best to help. Thank you so much for your continued support! Kimberly and I are very grateful! If you have been following along, you know that beginning in 1997 (age 35) through the mid 2000s, I created logging software applications in VB6 for all the major ARRL, CQ and a good many other contests too. During the late 2000s, because of the support time requirements of my software, working full time at my "real" job, time for my wonderful wife Kimberly, raising two amazing sons and other family commitments, I had to focus on maintaining the existing programs. As much as I wanted to, I just wasn't able to add much to the package through those years because, as support time answering questions grew, that took the time and energy I was previously able to spend coding. My hope had been to be able to retire in 2017 and begin working on the software full time then. Wonderfully, in the fall of 2011, my employer made a general contingent offer of a reduced rate early retirement, for which I barely qualified in terms of years of service. Another requirement, that it appeared I could not meet, was that they either had to be able to eliminate my function (they could not), or reorganize in a way that another person could assume my duties. I was initially told the likelihood of being granted the conditional retirement was slim and none. Long story short, through an amazing combination of circumstances aligning, I was granted the opportunity to take the retirement effective March 1, 2012, 5 years ahead of plan! Thanks to all for your thoughts, encouragement and most of all your prayers during this time. I can't tell you how much I appreciate it! I need to qualify "retirement". My dad lived to 93 and mom is well into her 90s. While no day is certain, Lord willing, I'm hopeful that I've got a long way to go. I am nowhere near ready to watch the grass grow. I have lots of goals and dreams that I am thrilled to be able to fully devote my time to! As of March 2012, I finally completed the last round of upgrades to the old, VB6 programs. Beginning in the spring of 2012, I began the mammoth project of learning C#.net and then rewriting all my software in the new language. Microsoft had phased out support for VB6, so this rewrite ensures that my software will continue to run on future operating systems. I learned a lot the first time around in VB6 that I was able to apply to the C#.net rewrites. As a result, the new versions are much better in many ways! As of January 2016, I have rewritten every old VB6 logging program in C#.NET and I've added quite a few new, additional programs to the package too! The new program upgrades have been extremly well received and the total count for the programs in the N3FJP Software package is now over 100! While more package additions are always possible and your suggestions are welcome, the vast majority of the contests that I planned to support are now included in the N3FJP Software package. Now my goal is to brainstorm and continually improve the software. As always, your suggestions to make the programs even better are always welcome and deeply appreciated! You may have noticed the small Affirmatech logo on the new N3FJP Software splash screen. In addition to Amateur Radio Logging Software, which will always be at the core of my activities, eventually I am hoping to expand into other product lines with my family. My two sons, Chris, KB3KCN, Brad, KB3MNE and daughter-in-law, Samantha, are all gifted programmers. One of our dreams is to build a software business together. Looking farther out, Lord willing, we are eventually planning some Affirmatech software products as well! Here's all the recent N3FJP Software developments and stuff I've been up to lately!